December 31st is upon us already! Wow... You've endured plenty of my 'where has the time gone' ramblings, so I'll skip that this time. My NYE mani came to me in a moment of inspiration last month. I never have moments of inspiration. Or...I do, but then I never actually get around to the execution part. The idea I had was to represent this year with a texture (are we done yet? please? ), next year with a satin (I hope I hope I hope I hope), and give a nod to FINALLY managing to stamp successfully this year after more than six months of failure. That post even mentions an idea that I still haven't acted on. How appropriate. My New Years idea though? Totally happened! 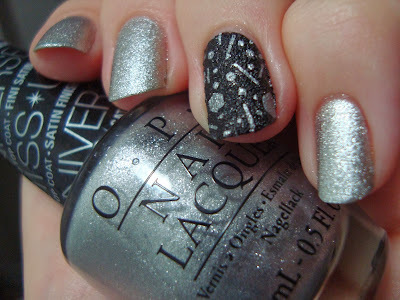 I used OPI This Gown Needs A Crown and Sally Hansen Lick-O-Rich, with Sally Hansen Platinum Star for the stamping. I used Bundle Monster plate BM-408. I feel like this is the perfect end of the year mani for me. It really ties it all together and it uses one of my favorite new polishes of the year. Yay! This Gown Needs A Crown takes two photos to even begin to get the point across about the finish...but you really need to see it for yourself. I really hope satins are the big trend of '14. It's looking like it might happen, since Sally Hansen has eight out now too! Look for swatches of four of them on here very soon. I'm tempted to get the gold and silver too, to compare them to This Gown Needs A Crown and the just-released Love.Angel.Music.Baby...when I get that. So that's what L.A.M.B. stands for? I'd never wondered enough to find out! I'll be making a nail supply trip soon and maybe I'll luck out and they'll have the Gwen Stefani collection. We'll see! I'm still not used to this length! I just couldn't stand that patch anymore. I have a few resolutions that will affect the blog in the new year. The big one is to wear more of my untrieds. I have over SEVEN HUNDRED polishes that I've never worn! As my collection's grown I've steadily bought twice as fast as I've worn them. I plan to fix that a bit in the new year, so expect to see older polishes sometimes, in addition to my usual new collection swatches. I'll also be restarting Slimdown Saturday and Nichole might be joining me! In general I want to try to focus on the rest of my appearance in general. Last year was rough and the year before was trying too and I've really gotten away from that little bit of extra effort. Hell, I let this happen. Never again! I need to try harder next year, all around. So have a great NYE and drink one for me if you're imbibing....I'll be at work. Yay. Nichole will be back tomorrow and I'll be back to my standard swatching. I miss it!